While the rest of us are truckin' it to the local country club or community center, Hollywood's elite can practice their backstroke in the comfort of their own luxurious swimming holes. 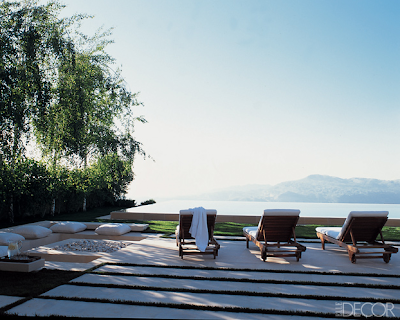 Above, the modernist pool design of Coach President Reed Krakoff's beach retreat comes complete with a pool house. This was my second favorite, (we'll get to my favorite-favorite momentarily.) It belongs to Ben Stiller and his wife Christine Taylor and I LOVE IT. With its heavy Spanish and Middle Eastern style influences, this outdoor oasis is fit for a king...or a king of comedy. 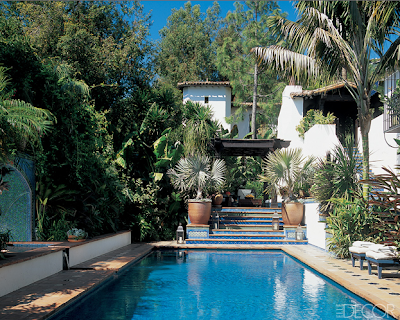 Grey's Anatomy star Ellen Pompeo wanted her pool to look like something straight out of a Mediterranean postcard. I think she nailed it. And now, my favorite. Of course it would belong to none other than the très fabuleux clothing designer, Roberto Cavalli. Notice those animal print lounge cushions? To die for, I tell you. Want to see more star-worthy swimming holes? Click on over to Elle Decor and check out the feature for yourself. Which of the pools would you most like to take a dip in? I think this is my fave post of yours ever! I love looking at other people's pools! Love this post! I wish I was swimming instead of working! haha! Wow! Elie Saab's view is amazing! What a luxurious life he leads! I love swimming pools and I love all of those! Being outdoors is great! wow, i could seriously take a dip in these! i love that first one--so unique! This post was super creative, I must say! All of these pool oasis's are to die for. I love them all! I like the Manhattan townhouse the best, but they are all fabulous, especially Ellen's house and pool! !